I’m officially ready to start back on the blogging train. I’ve got so many ideas for the house, the blog, traveling, organizing, etc., and I need to get back to my happy place to channel those. This blog totally fits that for me. So, I’m happy to be here and hope you are happy to be here as well. Today, I want to chat a bit about storage, and particularly kitchen storage. Do you remember when our kitchen looked like this? Just keeping it real with the dishes drying on the sink. lol. We took down all those upper cabinets. We lost a ton of storage by taking them down, but I’m not worried about it. That doesn’t mean that I don’t need organization though. We have some crazy messes underneath the cabinets and need something to help us organize in the pantry. Since you all loved my round-up of affordable storage options for a kids room, I figured you’d love to see the storage options I’m considering in the kitchen. 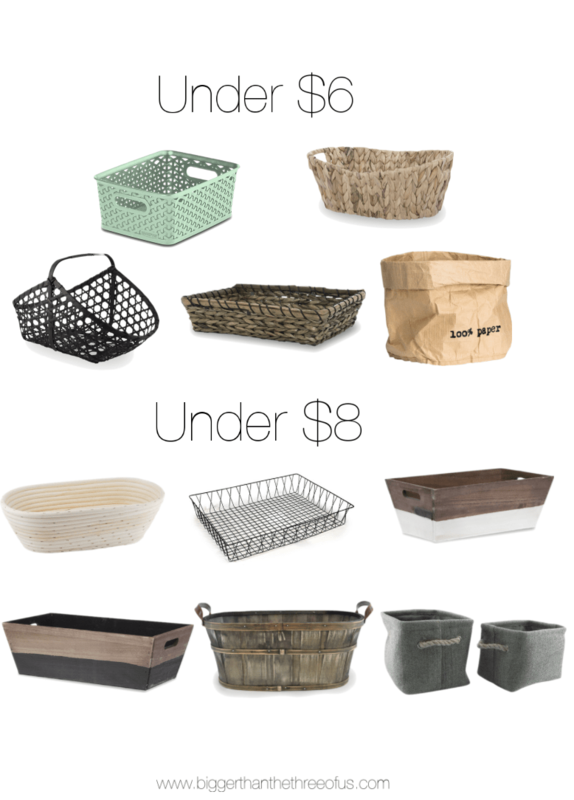 Buying baskets that match and help organize everything can get expensive. I don’t know about you, but I’d rather spend my money on things that will show 100% of the time rather than things that organize behind the scenes. BUT, we all need organization and some of us more than others (I’m talking to you, Luke Mayes). So, affordable organization is a must. So, I’m ready to spend a little bit of money behind the scenes to help organize. 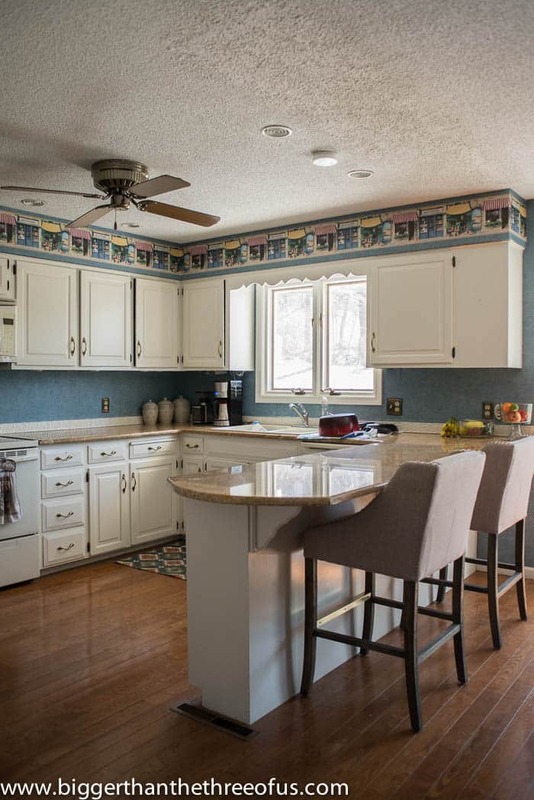 Ready to get your cabinets and pantry organized with me? *Affiliate links are below. Thanks for supporting this blog. Feel free to read my full disclosure policy. I need a more rectangular-type basket for the pantry but could go with a circular basket in a few other areas. 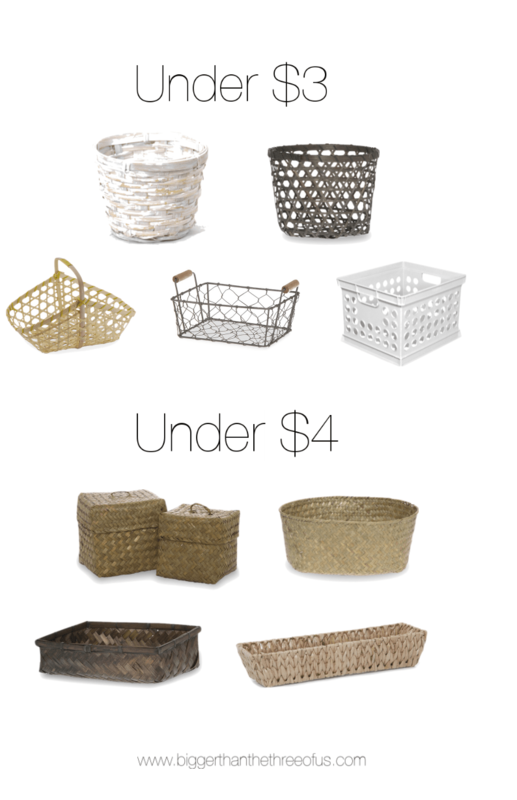 I’m loving the look of a rattan basket but realize that plastic might be the best choice for food. That paper bag is so funky that I love it. How about those dipped wood crates? Yep, I could see those in my pantry for sure. 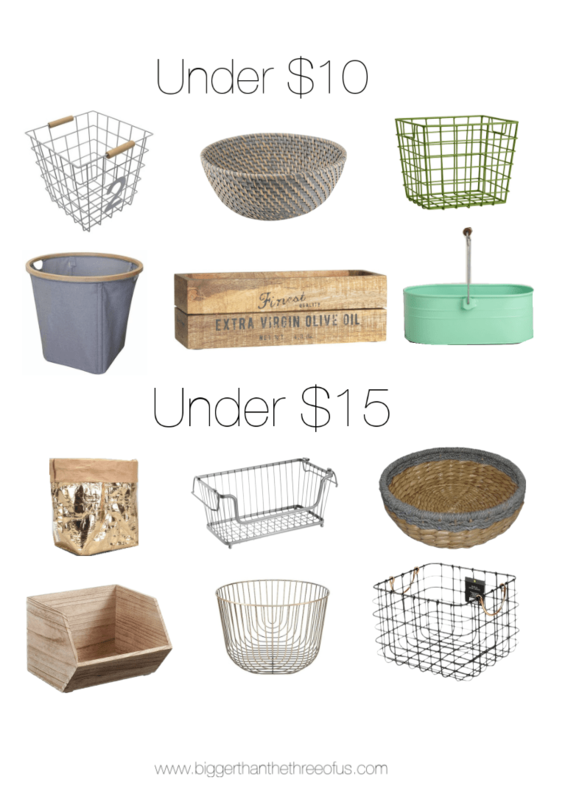 If you saw my last round-up then you know that I love a metal basket. We used those in Greyson’s bedroom and have loved them. There are no shortages of good options in the metal basket arena. If I was going to spend $15, I would definitely go with that wooden open box (#4). I think that would be the perfect organizer for snacks, rice, etc. Do you have a favorite? How’s your pantry organized? Or is it organized?